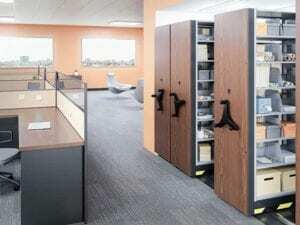 JB Office Matters core business is filing and filing solutions. Our team has decades of experience in designing and implementing filing systems from the simple to the complex. Whether you are making a furniture or space management decision, every business has filing challenges that are likely part of the plan. Filing costs space which means it has the potential to cost money and a lot of it. In many businesses records storage and management can become so time and space consuming that it can take over daily operations. Working with a team of professionals who have been there from the beginning of the modern filing system is your best insurance against skyrocketing costs as your business grows. Space management, furniture and filing are at the core of your business, when you work with JB Office Matters you are working with a team that understands all of them. We know where you can gain some advantage with one method or another just depending on your own unique challenges and requirements. JB Office Matters provides the technology your business needs to start down the road to the most modern systems you can employ. The key to a good filing system plan is to start right and to start smart. Even if you are creating as little as 10 files a day or as many as 1000, the right technology and a planned outcome is your best choice. Files require labels. Top Tab, End tab, Folios, Binders, even. If you are making a record, you’re labeling it, in all likelihood, or you should be. Why? Standard labeling of files eliminates mistakes and creates record sets that are alike, from record to record. JB Office Matters has partnered with Simplicity Solutions Group to create a high end web based SaaS application to start you down the road quickly, easily and at far less cost than you are likely paying currently. JB Office Matters is a certified partner of File Label Express for label printing and basic file tracking. Try JB Office Matters Records Management today, it’s easy and it’s free.